This is a wireless demonstrator,I hope this product can provide convenient help for the speaker. 360 degree free control without direction restrictions,And Free to move in the room. Ideal for lecturers, Meeting presenters, teachers,sales managers or anyone giving a Power Point presentation. Fully supports PowerPoint, Keynote, Prezi and OpenOffice. A free gift (Demonstrator bag). Notice: A pointer should not be directed at people or animals, please use it properly. Answer: Yes. I have used it with PowerPoint presentations on both Mac and Windows. I have also used it with Prezi presentations on Windows. 2.Question: Does this usb have storage for powerpoints? Answer: No ,the USB is the receiver for the unit and plugs into a USB port to connect the pointer to the computer wirelessly. 【LIFE&REACTION】:Powerpoint wireless clicker adopts triple silicone buffer +PC hard membrane button +0.35um gold plate design, After bearing 1 million compression tests, Powerpoint presenter reaction is still sensitive. 【Professional battery】：1200mah professional battery is 3 times stronger than the same battery.Automatic standby+deep sleep+ independent power switch,triple power-saving design makes presenter powerpoint more saving power and using longer. 【RED LASER POINTER】: Red bright light that's easy to see against most backgrounds, highlight key areas of your slides. Braille bumps are distributed on the keys, You can accurately and soundless touch positions of keys without looking down to search for them. 【REMOTE CONTROL&DIRECTIONLESS TILIMIT】:Use 2.4G RF imported chip. 360 degrees free control without direction limit. checked powerpoint wireless presenter in the house from approx 50 feet away ,Wireless presentation pointer still worked very well. 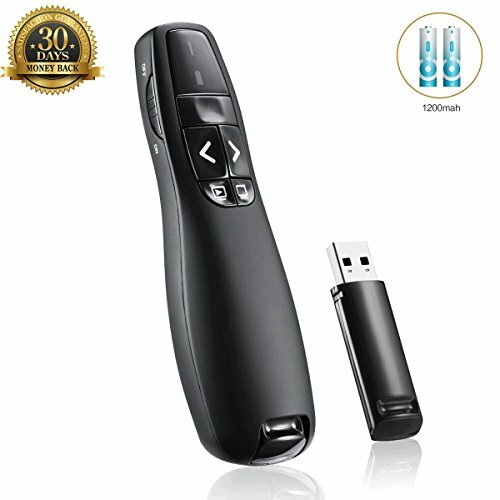 【Warranty and support】: 2 year warranty card and good after-sales service, a box for storing PowerPoint remote control with USB receiver, 2 AAA batteries.free gift : 1 x bag. If you have any questions about this product by BOLLAER, contact us by completing and submitting the form below. If you are looking for a specif part number, please include it with your message.